My previews for the US biathlon teams will be briefer, which reflects the fact that I know less about the US biathlon team, and biathlon in general. Feel free to correct me in the comments if I get anything horribly wrong. 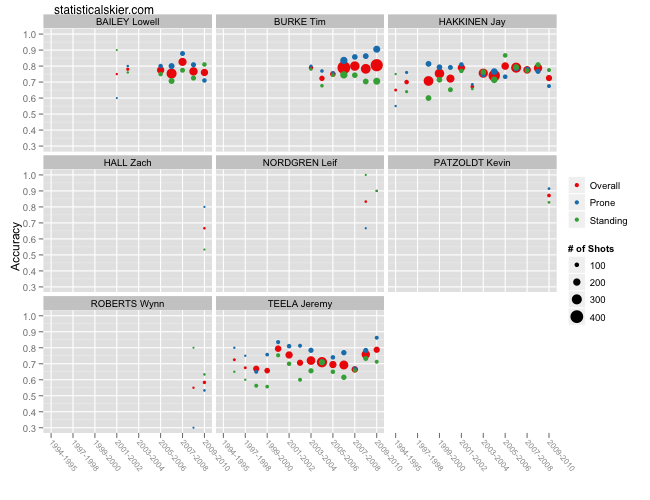 For example, I’m going to take a very simplistic approach to who’s actually on the US team by just looking at the skiers I have data on. The team selections seem pretty fluid to me through and between seasons. 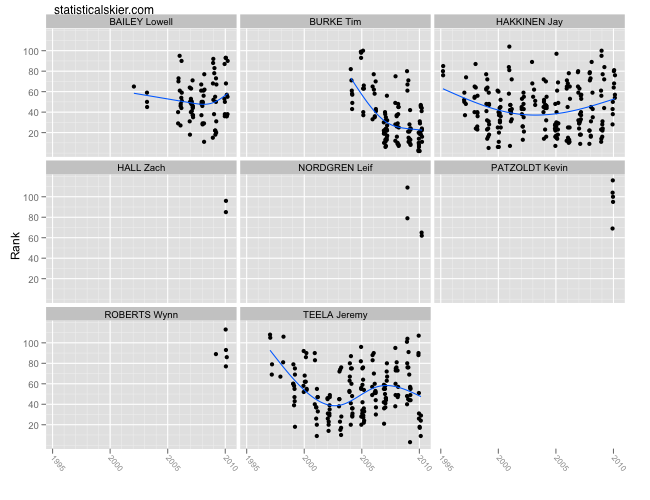 I’ve plotted only results from World Cups, Olympics and World Biathlon Championships here, and obviously only four guys have enough data to merit trend lines. Tim Burke’s dramatic improvement in recent years is evident, although it’s a bit hard to pick out his stellar season last year in these data. Lowell Bailey had a bit of an off season last year after breaking into the top twenty on occasion in recent years. Jay Hakkinen also had an off year, after being a very consistent presence in the top twenty for many years. Jeremy Teela is an interesting case. He had been steadily struggling more and more for quite a few seasons and rather dramatically turned things around last year. We’ll revisit that in a moment. A handful of younger skiers cut their teeth at World Cups or the Olympics as well, although none of them really showed anything at the same level as Burke, Teela, Hakkinen or Bailey. This graph should be fairly self explanatory. If some dots are hard to see, or apparently missing, it’s because of overplotting. Once again, if you’re unfamiliar with biathlon, keep in mind how crucial shooting accuracy can be, so small changes here can easily translate into minutes in a ski race. Here we find the answer to Teela’s sudden resurgence last year. His shooting had been steadily declining for basically eight years and then he rebounded dramatically, improving his overall shooting accuracy by more than 10 percentage points in two seasons. Let me emphasize that that is a huge improvement; the difference between shooting 65% and nearly 80% could easily translate into averaging 2-3 fewer misses per race. This could mean anywhere from 45 seconds to several minutes, depending on the race. On the other hand, Hakkinen, who had an off year last year, saw his shooting slip a bit after being a very consistent shot for many seasons. 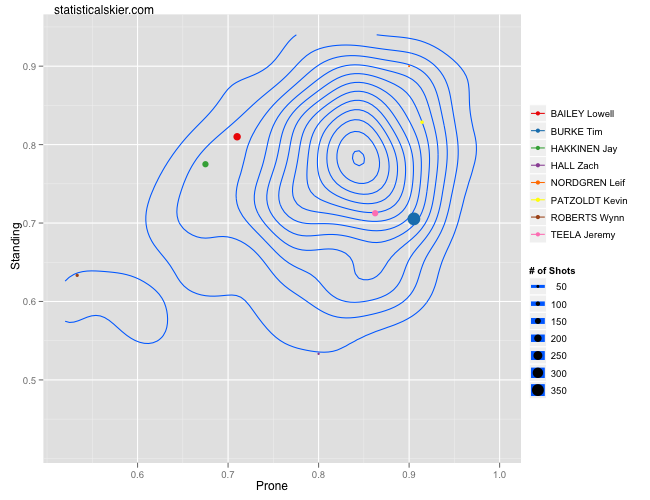 The contour plot represents male WC skiers with at least 50 shots last season; it’s better to be as far up near the right corner as possible. Then I plotted these eight guy’s shooting stats separately. Some of the dots are a bit hard to see, since their size if proportional to their respective sample sizes. If you squint a bit, you’ll find them all. Leif Nordgren and Kevin Patzold didn’t race much, but when they did they shot very well. On the opposite side of the spectrum, Wynn Roberts and Zach Hall (an old teammate of mine) also didn’t race much but didn’t fare so well in the range. Each of the remaining four are sort of dancing around that upper right corner where everyone wants to be. Lowell Bailey and Jay Hakkinen were about average standing, but struggled some shooting prone. Conversely, Tim Burke and Jeremy Teela were about average or slightly above shooting prone, but struggled somewhat standing. I struggled with how exactly to plot these guy’s results. Biathlon doesn’t have an equivalent to FIS points in cross country skiing, so although I could have used percent back, that wouldn’t take into account the strength of the field. I settled on just using rank, and then coloring the points by the type of race, so you have to make your own judgement about which 10th place results are more meaningful than others. Another way to say this is that the only points that are strictly comparable are those of the same color. I’m even less comfortable making predictions about biathlon, but here it goes: Burke will have another excellent season, but not one that’s a big improvement. He might sneak onto the podium but only if everything breaks his way. Teela will continue to ride his shooting renaissance to some consistently good (but not spectacular) results, putting him in the top thirty, but probably not often much higher. I certainly hope that Hakkinen and Bailey will rebound this year, but your guess is as good as mine, really. As for the younger guys, I’m not sure we’ve seen anyone who’s really going to be competitive with the big four of Burke, Teela, Hakkinen and Bailey. Posted by Joran on Tuesday, November 30, 2010, at 6:00 am. Filed under Uncategorized. Tagged biathlon, jay hakkinen, jeremy teela, lowell bailey, season preview, tim burke, usst. Follow any responses to this post with its comments RSS feed. You can post a comment or trackback from your blog.